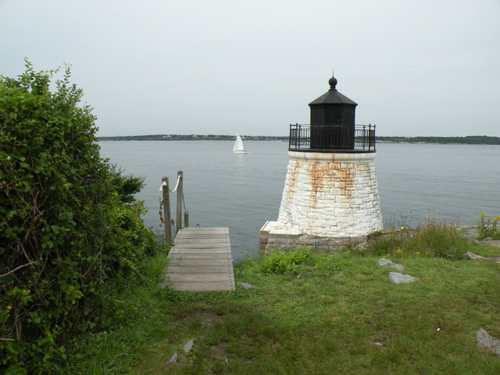 Castle Hill Light has been guiding mariners into Narragansett Bay since 1890. 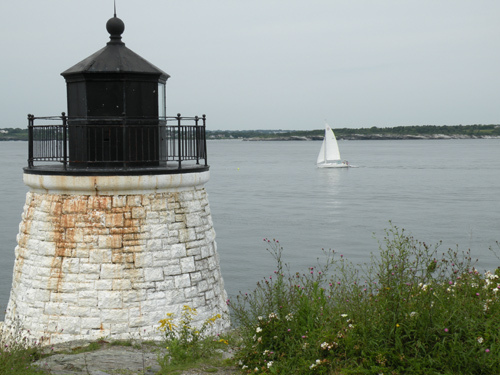 It is one of my favorites among the lesser-known Newport RI attractions. 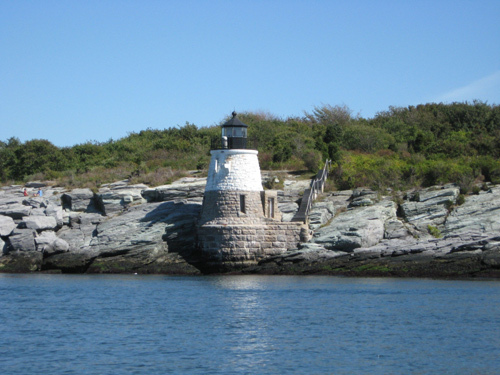 The lighthouse is the property of the U.S. government, but the property surrounding it is owned by the Castle Hill Inn and Resort. 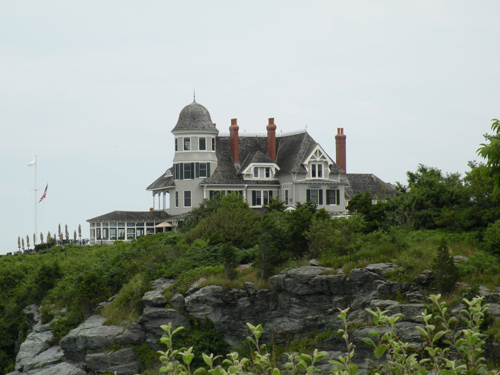 Castle Hill is not only one of the best Newport Rhode Island hotels and Newport Rhode Island restaurants, but it's also one of the best wedding destinations on the island. 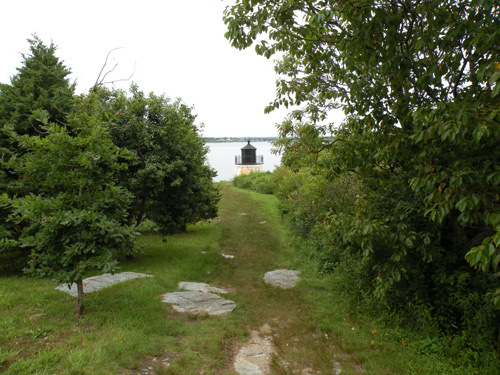 Unfortunately, only guests of the Inn "have permission" to access the walking trail that gets you to the lighthouse. 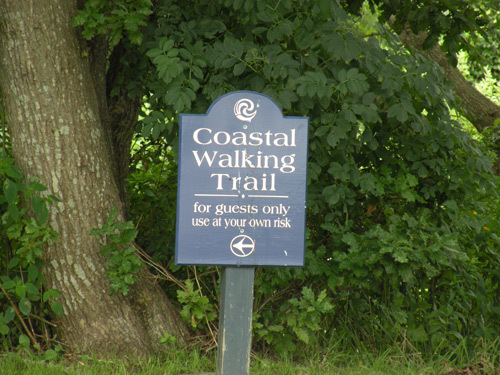 That being said, once you "become a guest", just go all the way to the end of the parking lot (up top by the mansion), where you'll see a sign for the Coastal Walking Trail. 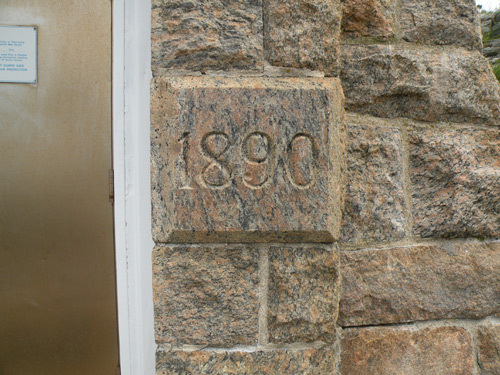 Don't let the sign intimidate you. 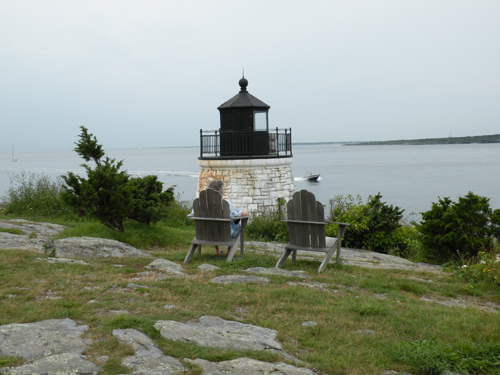 It's only a short walk down the trail until you reach the lighthouse, and there's even some chairs on the path if you need to take a rest before you get there. 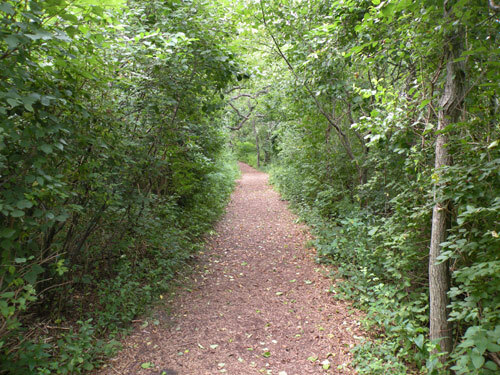 As you come to the end of the trail, you'll see this opening. 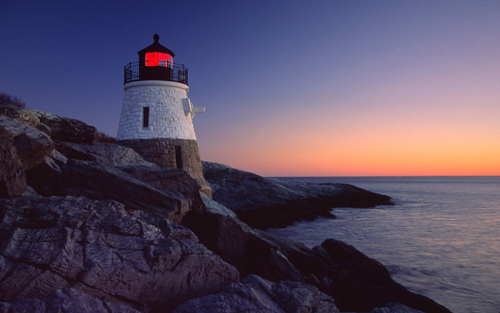 Just make a right here, and the lighthouse is just a few more steps down in front of you. You're almost there, keep going! You made it! Perfect timing with the sailboat going by too. Now this is a great spot to relax! You couldn't ask for a better view. 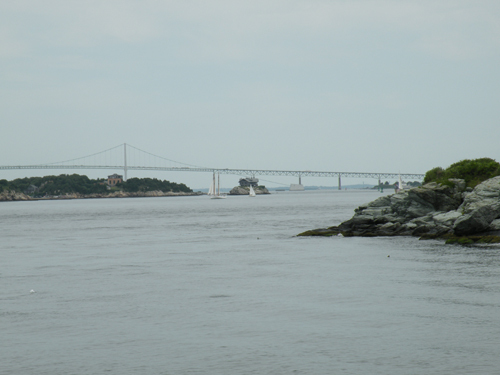 Sit here for awhile and enjoy watching the boats go by. 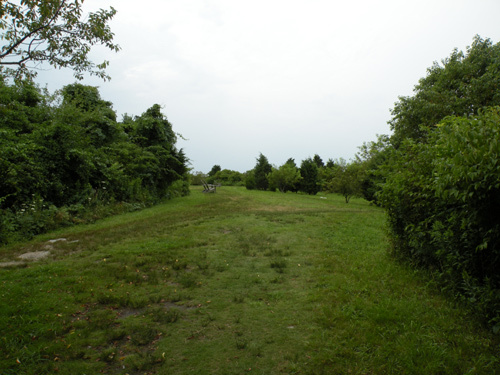 You could even bring a book and some beverages and spend an afternoon out here. 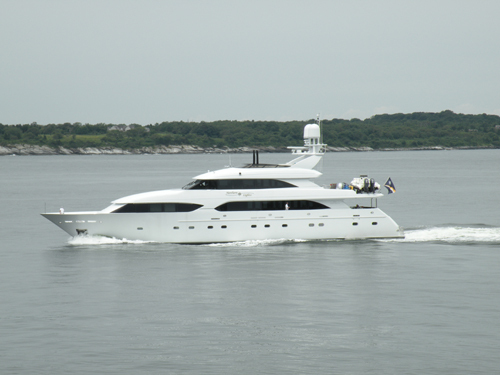 and a yacht I wouldn't mind traveling on! 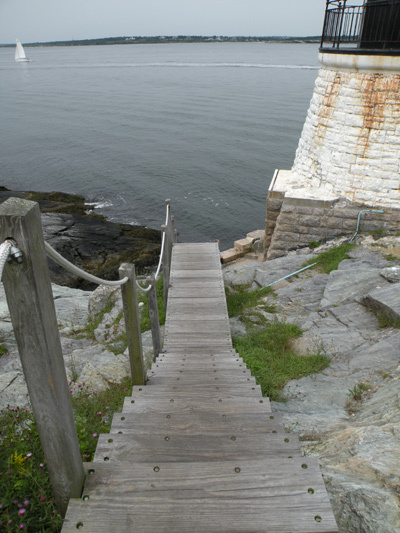 The lighthouse itself is not open to the public, but you can walk down the staircase to get a closer look. Just be careful, as it's very steep. Take your time and be sure to hold the rope as you make your way down. 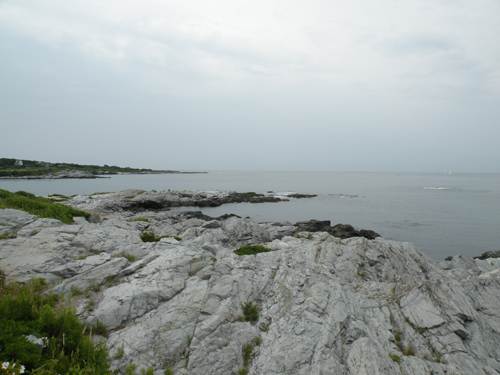 the beautiful view of the ocean from the rocks. And last but not least...check out this amazing 360 degree panoramic image, courtesy of Chris Blake of Aerial Vr. Click on the Full Screen button for the full effect.